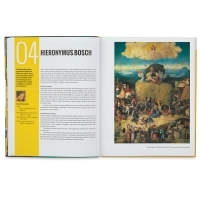 The accessible and interesting reference guides in the You Should Know series provide practical art history lessons for everyone to enjoy. Subjects include great artists, famous artworks, and architecture. Paperback. 7¾" × 9½" (20 cm × 24 cm). Impressionism: 50 Paintings You Should Know — No artistic education is complete without an exploration of the Impressionists. 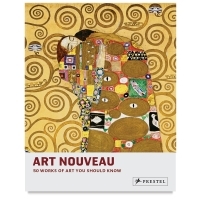 This book covers the most important works from the early 19th through the early 20th century, including the best of Monet, Degas, van Gogh, Renoir, Cézanne, Cassatt, Manet, Seurat, and Pisarro. 144 pages. 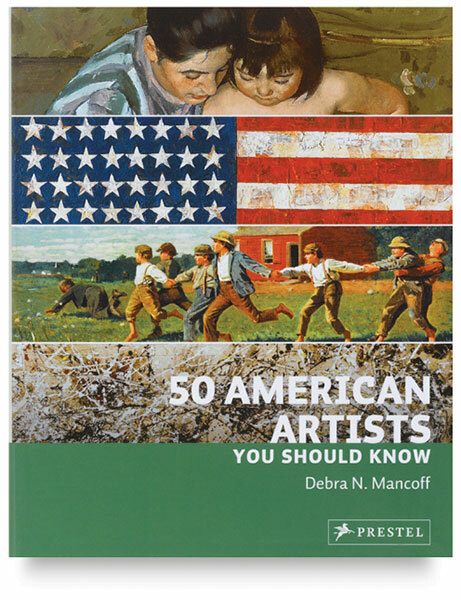 50 American Artists You Should Know — The history of American art is as varied as its 50 states. This book celebrates the artists who placed America at the forefront of modern art — Jackson Pollock, Willem de Kooning, Robert Rauschenberg, Jasper Johns, Claes Oldenburg, and Andy Warhol. 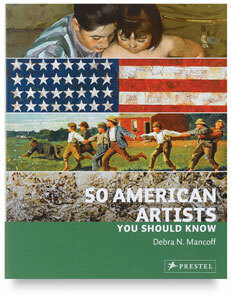 This is an indispensable volume for anyone interested in learning about American art. 160 pages. 50 Photographers You Should Know — The world's great photographers from the inception of photography to the present day are featured in this dynamic book. From Félix Nadar to Nan Goldin, each of the photographers profiled represents an important aspect of the evolution of photography. 176 pages. 50 Paintings You Should Know — This book offers readers a crash course in art history spanning seven centuries. Featured works include Giotto's Arena Chapel frescoes, Botticelli's The Birth of Venus , and Leonardo da Vinci's Mona Lisa . 176 pages. 50 Buildings You Should Know — This handsome volume presents 50 buildings in chronological order, representing the most compelling, intriguing, and awe-inspiring structures in the world. This world tour of great buildings offers a mini-course in architecture for readers of all ages. 176 pages. 50 Artists You Should Know — This is is a vibrant reference guide profiling 50 major artists alongside their representative works. Arranged chronologically, the selection of artists featured in 50 Artists You Should Know includes every major artistic movement and development since the Gothic period. 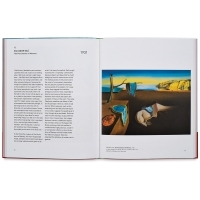 It provides readers a clear understanding of the evolution of the visual arts. 176 pages. 50 Contemporary Artists You Should Know — 50 of the most influential contemporary artists are profiled in this colorful and engaging book that traces the various artistic movements and radical changes of the second half of the 20th and early 21st centuries. 160 pages. 50 British Artists You Should Know — A highly readable and informative collection of the best of British art. 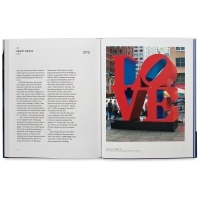 Each artist is presented in a double-page spread that features a major work, details from the work, a brief biography, and fascinating insights into the artist’s life and times. 160 pages. 50 Art Movements You Should Know — Filled with stunning reproductions of some of the world’s greatest masterpieces, 50 Art Movements You Should Know offers a chronological journey through artistic revolutions, from Realism to the New Leipzig School. Covering a wide range of movements, both familiar and obscure, this accessible and informative volume is a perfect introduction for readers interested in art's constantly evolving story. 144 pages. 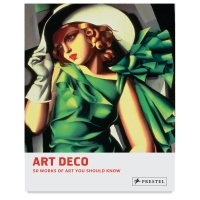 Art Deco: 50 Works of Art You Should Know — Originating in France after World War I, Art Deco quickly spread throughout Europe and America, and encompassed nearly every artistic medium from paintings and photography to furnishings and film. 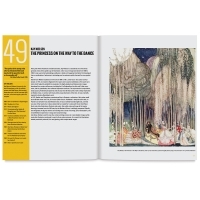 In this book, 50 iconic examples of the moment are presented chronologically in full-page spreads that are accompanied by explanatory texts and short biographies of the artists. 128 pages. Art Nouveau: 50 Works of Art You Should Know — The heyday of the Art Nouveau style was relatively short, spanning the decades immediately before and after 1900. However it was a tremendously important period, not only for its radical shift away from the academic and romantic movements of the late 19th century, but also for its embrace of nature and natural forms. 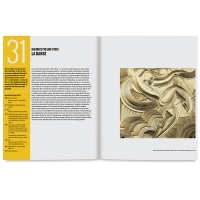 This authoritative, accessible, and beautifully illustrated book explores 50 of the movement's most important works, and shows how it impacted every artistic discipline, from architecture to graphic arts to painting to home décor. 128 pages. 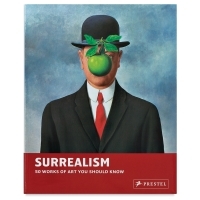 Surrealism: 50 Works of Art You Should Know — The Surrealist movement that developed in Europe following the devastation of World War I swept energetically through all kinds of media as artists found expression in an imaginative pictorial language. This book introduces readers to 50 unique artworks that have lost nothing of their irresistible attraction to this day. 144 pages. 50 Photos You Should Know — This collection of world-renowned photographs offers a stunning visual history of photography and photojournalism. Recording moments both intimate and earth-shattering, the chronologically arranged compendium includes iconic images of people, places, and important events, from the dawn of photography to the present. From movie stars and artists to the surface of Mars to the attack on the World Trade Center in 2001, the double-page spreads in this volume bring our collective history and visual culture to life. 160 pages. 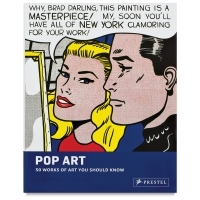 Pop Art: 50 Artworks You Should Know — This introduction to Pop focuses on 50 of the movement’s most important works and covers every major artist associated with the style, including David Hockney, Jasper Johns, Roy Lichtenstein, Robert Rauschenberg, and Andy Warhol. 144 pages. 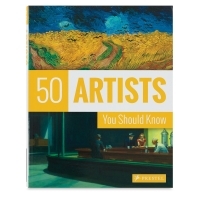 50 Portraits You Should Know — This wide-ranging collection includes 50 iconic portraits by world-renowned artists. Arranged chronologically, the portraits exemplify either an important moment in history or a turning point in the artist's career. Van Eyck's Man in a Turban , Da Vinci's Mona Lisa , Vermeer's Girl With a Pearl Earring , Sargent's Madame X , Kahlo's Self-Portrait with Necklace , Warhol's Marilyn , are all included, to name just a few. Exquisite full-page reproductions of the works are accompanied by engaging and enlightening texts. 144 pages.